I remember reading Ben Ripley’s script for Source Code back in 2007, the year it made the annual Black List of Hollywood’s best unproduced screenplays. The tale of a soldier stuck in a time loop played like a serious version of Groundhog Day and promised to be a lot of fun…if it ever got made. Thankfully it attracted the attention of both director Duncan Jones (Moon) and actor Jake Gyllenhaal, and the resulting 2011 film is an underrated genre classic that not nearly enough people seem to remember. Well, it might be a perfect time to rewatch Source Code, as it may be getting a sequel. Variety reports that Source Code 2 is entering development in earnest, with the Mark Gordon Company and Vendome Pictures both returning to produce. Jones’ star is on the rise these days, with him currently in post-production on the Warcraft movie, so he won’t be returning to direct, but Source Code screenwriter Ben Ripley is back to pen the sequel, which is encouraging. Anna Foerster, who has helmed numerous episodes of both Criminal Minds and Starz’s Outlander adaptation, will be directing the film. While legitimate science fiction has all but vanished from television, it lives on in movie theaters as dozens of science fiction films continue to be released every year. Almost every Hollywood blockbuster contains at least a sci-fi element or two, but for this list I’ve stuck with the films that are truly a part of the genre. If you love science fiction make sure you didn’t miss any of these 2011 films. These were the best sci-fi movies of 2011. Attack the Block is so good it’s one of two movies on this list that made my best films of 2011 list over on Cinema Blend. Here’s why. This little indie movie from writer/director Joe Cornish takes the worn out alien invasion genre and injects new life. In large part it’s because, though it has plenty of it, his film is about more than reveling in man on alien violence. Attack the Block goes its own way by creating characters who don’t fit any of the usual stereotyped molds. Instead our heroes are a bunch of teenage thugs, completely unlikable idiots who only become worth rooting for after they’ve been changed by their experience. Attack the Block is content to let you hate everyone in it when the movie begins, certain you’ll love the kinds of people they’re starting to become by the time the movie ends. Attack the Block manages to come up with something new in a genre that hasn’t even been trying. From creature design to story structure to its completely unflinching take on some pretty scary alien violence, it succeeds. A violent, gory, action movie which also comments on the lives of frightened people living in a crummy apartment complex full of absent parents and pre-teen drug dealers? What’s not to love? Cornish’s sci-fi movie is a grand mix of alien entertainment and subtle social commentary. It’s relevant without being preachy, violent without being gratuitous, and action packed without skimping on character. 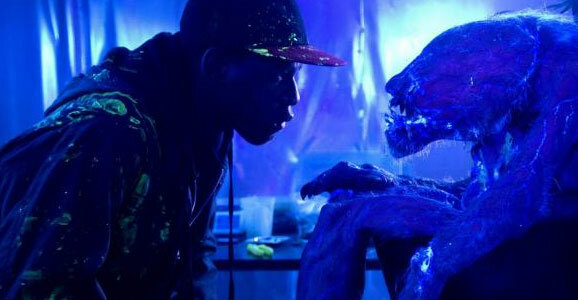 Attack the Block is proof that you don’t need a big Hollywood effects budget to do science fiction right. Science fiction, unlike any other genre is about more than just characters or even good storytelling. Whether those ideas resulted in thought-provoking discourse, unimaginable creatures, or simply really cool gadgets we think it’s worth remembering the best of them. These are the 8 best science fiction ideas captured on film in 2011. WARNING! The following article contains significant spoilers for some 2011 movies. If you don’t want to know, don’t go any further. Blacker than midnight and without eyes of any kind, the aliens in Attack the Block look more like a hairy hole in the fabric of space than an actual creature, at least until they open their mouths. Thanks to the neon colors flowing through their innards, the extraterrestrials’ vicious looking fangs glow when they open their maw and go in for the kill. It’s a clever creature design, a great example of limited budget forcing filmmakers to think outside the box. It’s especially noteworthy in a year where so many big budget alien movies seemed to have run out of ways to make aliens look interesting. The best JJ Abrams’ mega-budgeted Super 8 could come up with was a giant spider and the less said about the generic outer space creatures in Battle: LA the better. Attack the Block deserves a lot of credit for creating creatures we’ve never seen before and then doing something cool with them. Next week we’ll put together our best science fiction of 2011 list, but before we do that, it seems worthwhile to stop and take a look back at a few movies you might have missed. Maybe they never got a wide release in your area, maybe you were scared away by bad reviews, maybe you simply never got around to seeing them. But here are four really good science fiction films which we think more people should have seen, even if they didn’t. This low-budget indie got a lot of buzz coming out of the SXSW film festival in the spring, but when it finally showed up in theaters no one really talked about it. The fact that it was only in limited release probably prevented a lot of you from catching it, but the film did show up on your television through On Demand, which means it was at least available in some form to most potential viewers. It’s a shame then, that more of you didn’t see it because it’s not just good for a low-budget indie, it’s flat out good. There’s no need to grade Attack the Block on a budget curve. The story’s pretty simple. Aliens attack and the only thing in their way is a group of inner-city London kids with a propensity for violence. What makes it different is the way none of the film’s human characters fit the usual stereotyped molds. And unlike a lot of other alien invasions this year, aliens aren’t used just because they don’t have the balls to show people fighting humans. There’s an actual sci-fi story going on here, set to the blazing beat of the perfect soundtrack. Attack the Block is unflinching in its violence, no character is safe, and it has something to say. Science fiction is always at its best when used to comment on modern problems, and Attack the Block does that brilliantly by delivering a thrilling action movie with unusual characters and freaky aliens unlike any you’ve ever seen.